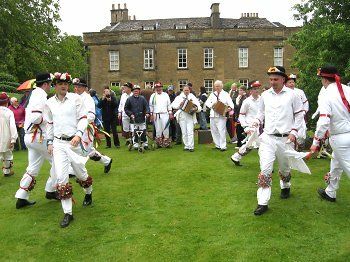 This year at Bampton we shall miss his gentle gravity and Edwardian charm, and another and younger musician will step into his formal 'whites' to make the old music in the streets and on the lawns of Bampton. As things turned out, 1959 was a strange year for the morris in this quiet Oxfordshire town. Francis Shergold, the acknowledged leader of the side originated by William Nathan 'Jingy' Wells in 1927, had decided not to field a team as he was unable to get enough dancers, and was content that Arnold Woodley would be taking out his group of young boys and men to keep the tradition alive. Shortly before Whitsun, one of Francis' regular dancers, Peter Alum, told him that Arnold wasn't going out after all, which led to a last minute attempt to put together dancers, musician and fool for an appearance. Following a series of frantic manoeuvres, four dancers were assembled, morris dance authority Russell Wortley dragooned in as fool, and revivialist fiddle player Jack Newton brought over from Buckinghamshire to supply the music. 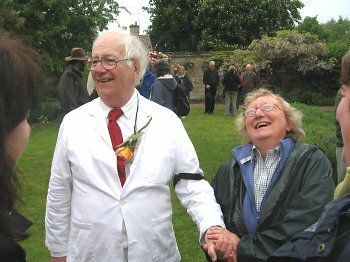 In fact, Arnold Woodley did go out on the Monday after all, the final occasion before a decade-long break. As Francis described the day, the dancing was easier with only four men: without the middles there were fewer people to avoid in the heys! During the early part of 1960, on a whim, Frank Purslow (he of Marrowbones and the three subsequent volumes of songs from the early 20th century Hammond and Gardiner manuscripts) walked the twelve miles from Abingdon to Bampton to visit Francis Shergold. The two men had never spoken, but Francis was happy to chat with this young man with such an obvious interest in morris dancing, especially as Purslow had recently been invited to join the traditional Abingdon side. Francis said that he had managed to arrange for two revivalist musicians to play for the coming Whit Monday performances, but there was no one really dependable on the horizon. Frank mentioned a young man from London, who came regularly to Bampton on the Whitsun weekend, and who might be persuaded to play for them. And so Reg Hall, one of the greatest living authorities on traditional English and Irish music and dance, made up the trio of musicians on Whit Monday 1960. The following year he played solo, and has continued to supply the music every Whitsun since that time. Other musicians have shared duties with him over the intervening decades - Frank Purslow, your own editor Rod Stradling, Francis Shergold's nephew Jamie Wheeler, and more recently Joe Perry - but only Reg has remained a constant. So it was that, on Spring Bank Holiday Monday, 25 May this year, Reg completed fifty years of continuous service. This was acknowledged by a presentation of an inscribed ceramic plate at Weald Manor, one of the regular stops on the annual tour. He was clearly touched by the occasion, and while declining to make a speech, characteristically declared, "Drinks all round!" Little did Mervyn Plunkett think in 1959 that his fellow editor of Ethnic would take over the role from Bertie Clark and still be going strong half a century later.